Fluidly, interactively explore any pre-produced or live-capture video: from stop frame to exponential speeds; along linear time or complex filtered pathways. 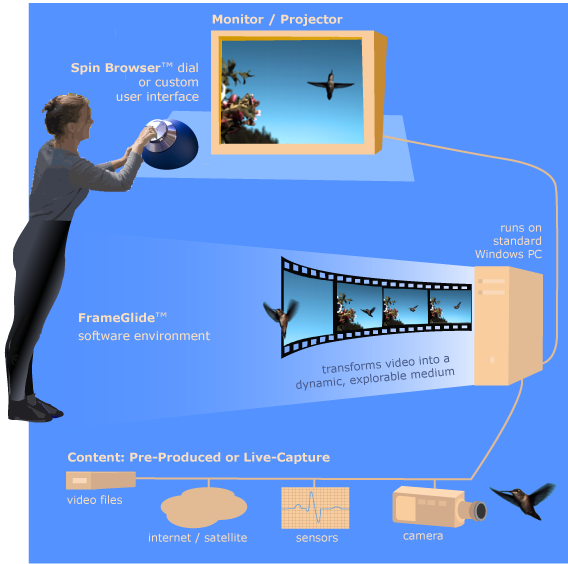 The four core FG|SB system elements are: the FrameGlide software running in a standard Windows environment, a Spin Browser dial (or other user interface), a source of content (live or pre-produced), and a monitor or projector. Basic systems can be set up in just minutes, and can be as compact and portable as a laptop with user interface attached. Our Spin Browser dial is often the preferred user interface, with its fluid feel matching the fluid visual experience. Custom interface designs are also readily supported, from simple linear slider to more exotic options such as time flow proportional to the frequency of surrounding music. High-end FrameGlide capabilities include multi-stream HD operation, real-time data fusion, and liquid-smooth operation over terabyte image files 100% in parallel with ongoing live capture. For a detailed feature list (in Appendix B), and testimonials from clients regarding the system's reliability and ruggedness, please see our Features and Advantages document. In several instances, TechnoFrolics' "Spin Browser" trademark has been applied inappropriately to refer generically to exhibits allowing rotary control of video. In response, we have been mailing out a friendly, clarifying letter, that also includes competitive advantages offered by our technology. That letter can be seen here.